I haven't written here in a while. Well... I haven't posted here in a while, but I've written here several times. I didn't post the fruits of those labors, simply because they were products of good ideas that, as I found out, which could not be stretched into full entries by themselves. Thus, I'm going to hit the highlights here, so I can move on. 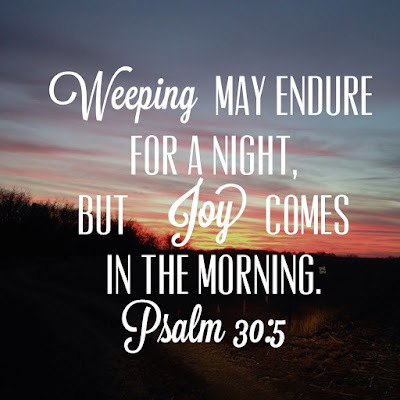 First, inspired by Psalms 30:5, I was going to write a blog entitled, "Weeping May Tarry For The Night, But Joy Comes With The Morning." I was going to write about the fact that in a world where our president is willing to hurt people to get what he wants and a cable channel is premiering a game show where participants win by not cheating on their lover, I feel like our society is running eagerly to embrace evil. I was going to point out that even at our lowest point there's still good in the world. I was going to point to Penzeys, the spice retailer, who used their commercial newsletter to land blast Trump's address from the Oval Office. Usually, companies try to stay neutral, so I was going to use them as proof there's still good in the world. While I believe it to be true, a longer entry on the subject became too Pollyanna-esc sickening sweet. Then I received 2 Corinthians 21:5 ~ "We are therefore Christ’s ambassadors, as though God were making his appeal through us. We implore you on Christ’s behalf: Be reconciled to God." in my Verse of The Day newsletter, and I was inspired to write another piece about our role as ambassadors of Jesus Christ. I made good headway on it too, but I could not find a way to wrap it up with anything except, "Let's be good out there," as if I was a Christian version of Sergeant Esterhaus. I was trying to say that we need to be loving examples of Christianity because we never know who's watching. I wanted to conclude with the idea that our role as ambassadors of Jesus Christ is a blessing, rather than a burden. When we live as ambassadors of Jesus Christ, we live in a way that helps us live happier lives. My mistake was trying to expand each idea into a long drawn out piece, and losing the core message. From now on, this blog will feature short, to the point, pieces. Hopefully the change in format will make this blog more useful to readers. If anyone has suggestions for this blog, feel free to email me at James@JamesKiester.com.